203 mm/50 3rd Year Type mod. C3 х 2 pcs. 120 mm/40 10th Year Type mod. B2/C4 х 1 pcs. 13 mm/76 Type93 Twin15 х 2 pcs. 25 mm/60 Type96 Twin mod. 12 х 2 pcs. 25 mm/60 Type96 Twin mod. 115 х 2 pcs. 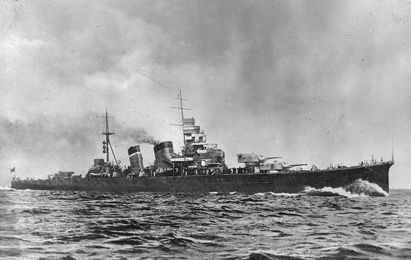 Aoba — Japanese Tier VI cruiser. Aoba represented a further development of Furutaka with main battery guns placed in twin turrets to achieve a longer gun range. Moreover, she outstripped her predecessor in torpedo armament power and AA defense capabilities. The Aoba isn't really much of a departure from her predecessor the Furutaka. In fact, ever since the addition of the Hull C upgrade to the Furutaka, which gives the Furutaka the exact same loadout as the Aoba, the Aoba's role as a 'seat adjuster' to get you accustomed to the aspects of the Japanese heavy cruiser has become redundant. That being said, if the Furutaka is the seat, then Aoba is still pretty much you sinking into the seat as it solidifies aspects of the Japanese cruisers introduced in the Furutaka. It's still an anti-ship combatant, it's still a skirmisher that specializes in medium to long ranges, it's still a ship that requires other ships to draw fire or to support in order to do well in. It's still a very good vessel to be a captain in, so long as you know her well. One of the things you will notice is the slightly less responsive(but common to the next two tiers, culminating in the Mogami's superslow 155 mm gun turrets) turrets and improved loading time of 4 seconds at best over her predecessor. Her responsiveness to fluid situations is also vastly improved for a Japanese cruiser. This allows you to be where you are needed and support when it is asked. It is with this that the Aoba can smash tier V light cruisers with ease and be a wary force for other heavy cruisers and battleships but not so much with carriers as her AA suite is sufficient to only defend herself alone. Her torpedoes are nothing special with the addition of the C hull for Furutaka and the much older 10 km torpedo addition, but, perplexingly, their reload is longer. Unfortunately, the positioning of them at the rear of the ship is a sort of downgrade from the Furutaka. Granted, this makes the Aoba a dangerous ship to chase, but it also makes it more obvious for enemy players to figure out when you launch torpedoes, as the rear mounts require you to turn the ship quite hard. Annoyingly enough, these rear mounted torpedoes also creates a blind spot where you cannot spot friendly ships trying to pass close to you. It's best that you let the Aoba behave as an anti-ship combatant rather than a solid AA screen. Yet, considering how useless Hydroacoustic search is in detecting destroyers, it's simply better to stick with the Defensive Fire cooldown and use it to at least disrupt enemy torpedo and dive bombers. The Aoba retains the narrow hull of the Furutaka and thus can bow in and expect to not be hit by battleship guns at longer ranges allowing continued fire. Combined with her excellent maneuverability and fast reverse speed of 17 knots holding that head on is rather easy and can still allow to you dodge the occasional torpedo salvo if coming from the front and the rear. That being said, while the Aoba is an anti-ship combatant, it does not have the armor or the reload speed to engage in prolonged gunnery duels with rapid firing American cruisers such as the equivalent tier Dallas and come out unscathed. 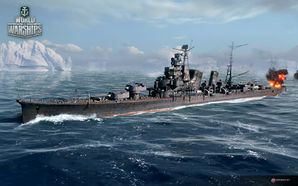 It is a threat to equivalent tier cruisers, but like the Furutaka, the Aoba is a skirmisher, good at harassment, great at medium to long ranges at about 8-15 kilometers where it can still use its maneuverability to avoid gunfire, and requires friendly ships to draw fire, or islands to duck behind to give it breathing space. Additional armor compared to Furutaka. Rate of fire beats any Japanese heavy cruiser. Good torpedo range for a heavy cruiser. Good anti-destroyer and anti-cruiser screen. Guns beat the equivalent ships of other nations, much better for dealing with cruisers of the equivalent tier. Fast. It can make 35 knots and has fairly quick acceleration, allowing it to keep up, outrun and support destroyers. Better turning circle than Furutaka makes it slightly easier to re-position and dodge shells. Gains Upgrade Slot 4. This is very helpful as Aoba frequently is up-tiered in Tier VIII battles, where battleships get seriously more threatening with better accuracy and of course shell damage. Retains the same ergonomics as her predecessor such as citadel size. The armor is thicker, but it's still a Japanese cruiser making it dangerous to go toe to toe in prolonged engagements. Torpedo tubes have a very limited launching arc. In fact, the rear mounted torpedoes make it obvious to experienced players when you're shooting them and necessitate the ship to show it's broadside to enemies. Slow speed of the torpedoes. Deck armor can be smashed even with destroyer guns. Slower firing rate of guns compared to many equivalent tier cruisers means that while it can still set fires, it will not do so as frequently. Captains should first research Aoba's second hull for the increase in health and maneuverability it provides. Lastly, captains should research the upgraded Gun Fire Control System to increase the ship's maximum firing range. The key skills for Aoba are nearly identical to those used on Furutaka. They include Expert Loader at Level 1, Expert Marksman at Level 2, Demolition Expert at Level 3, and Concealment Expert at Level 4. Captains who use the ship’s torpedoes often may find Torpedo Armament Expertise useful for reducing the reload time of the launchers. Last Stand is recommended to those who often find their engine or rudder incapacitated. Lastly, Basic Firing Training and Advanced Firing Training can be taken to improve upon the ship’s anti-aircraft armament. Premium version of all consumables are useful to reduce the cooldowns. Players who wish to spend doubloons can equip Aoba with Type 16 camouflage that lowers her detection radius, reduces the accuracy of incoming shells and increases the amount of experience she earns. Aoba captains should mount the standard flags to improve the ship's performance in battle. To improve upon the ship's armaments, India X-Ray ( ), Victor Lima ( ), and Juliet Whiskey Unaone ( ) flags are recommended to increase the fire chance and flooding chances respectively. To improve the ship’s survivability, captains should mount November Foxtrot ( ) and India Yankee ( ) flags. Sierra Mike ( ) flags are recommended to increase the ship’s already high top speed. Lastly, economic and special signal flags can be mounted to improve the ship’s economic gains per battle. he Aoba-class cruisers (青葉型巡洋艦 Aoba-gata jun'yōkan?) were a class of two Japanese heavy cruisers which saw service during World War II. WW-2 recognition drawing of Aoba class cruisers. Aoba out on sea trials. This page was last modified on 16 January 2019, at 02:08. This page has been accessed 68,991 times.